A (not quite) daily post on a different aspect of the European Middle Ages. There were many reasons why someone would become a pirate, I suppose. It was probably rare that a monk would do so, however. Eustace Busket was more than a monk and a pirate. Born about 1170 near Boulogne, he was a younger son of minor nobility who, not being likely to inherit much in the way of lands or titles, went to Toledo in Spain to study, where supposedly he took up "black magic" and produced marvels. For some reason, he gave up that life, returning home to join a Benedictine monastery at St. Samer near Calais. At some point he left the monastery and became the seneschal and bailiff for Count Renaud de Dammartin. Eustace was accused of mismanaging his duties, and about 1204 he fled his responsibilities and the accusations. He was declared an outlaw, and became a pirate, sailing the English Channel looking for plunder. He was a well-known figure, and King John paid him occasionally between 1205 and 1212 to harass Philip II of France. He would sometimes raid the English Coast for fun and profit and be declared an outlaw again, but King John always forgave him eventually to continue the harassment of Philip. John also gave him 30 ships to use in his missions. In 1212, Eustace switched to supporting France, and when English Civil war broke out in 1215 (ultimately leading to Magna Carta), he supported the English barons against King John. 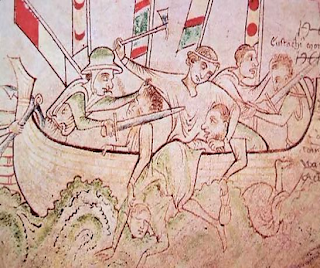 Eustace carried Prince Louis of France to England to join the Barons, and on a 1217 mission to bring Louis aid, he got caught up in the Battle of Dover. Eustace managed to escape, but his enemies caught up with him, and on 24 August 2017, at the Battle of Sandwich, he was caught. 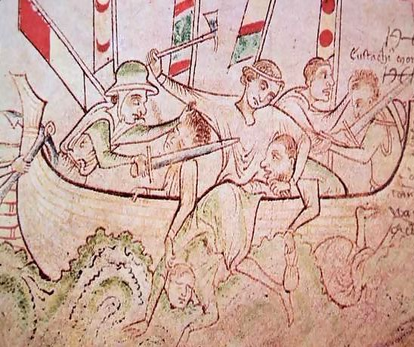 We do not know exactly how he was executed, but Mathew Paris portrays him as being beheaded (depicted above). The sequel to A Death in Catte Street. A Year in Oxford sees young Geoffrey Chaucer sent to Oxford University in January of 1361, in an attempt to increase his usefulness to the Court of Kind Edward. Between learning about Logic and Rhetoric, Arithmetic and Music, etc., he starts to notice a disturbing pattern of "accidental" deaths. 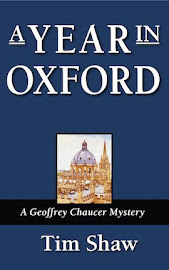 What links these citizens of Oxford, what is the significance of the phrases he finds placed in their graves, is one of his fellow clerks a murderer? More importantly, will he be able to figure out this puzzle and still get his homework done? Get it on Amazon, Smashwords, Barnes & Noble, or Apple's iBookstore for $1.99. A young Geoffrey Chaucer notices three men in London who shouldn't be there. Two days later, one of them is found dead in the basement of a locked house. Curiosity and a sense of moral obligation prompt him to explore the incident. His fumbling investigations—while more basement deaths turn up—lead him to learn more about the history of England than he ever suspected. This is the first novel by Tim Shaw in the projected series of Geoffrey Chaucer Mysteries. It is told in the first person, as a much older Chaucer looks back to his youth—far from the experienced and knowledgeable poet he was to become in later life. If you like your medieval history wrapped in fiction, this is for you. Want to take some of the best entries from Daily Medieval with you on your smart phone or e-reader? Want to share them with a friend? Now available from Amazon and Apple. ©Tim Shaw. Watermark theme. Powered by Blogger.